Tesla is going to start showing its Model X in Nordstrom beginning tomorrow. https://www.engadget.com/2016/06/14/tesla-will-soon-sell-evs-at-a-nordstrom-store-in-la/ Using a small portion of Nordstrom’s 400 square foot The Grove location in Los Angeles is one way to get around the blocked at nearly every turn by dealerships and “laws” that Tesla’s direct sales is accustomed to. And the move makes good business sense if you think about it. Tesla is counting on the fact that Nordstrom shoppers are the Model X’s demographic. If the program works, it might open the door to Tesla sharing space in more of the stores 121 locations across the U.S. and Canada. How’s that for innovation? While Tesla is wooing Nordstrom shoppers, another EV company is trying to capture the luxury market. http://www.autonews.com/article/20160614/OEM05/160619944/electric-car-startups-fueled-by-chinese-money-aim-to-catch-tesla. I’m starting to think that the average consumer’s dollars just aren’t good enough, but that’s another discussion for another time. This company, Atieva is funded by Chinese investors and was formed by former Tesla and Oracle workers. Atieva’s Chief Technology Officer is ex Tesla Model S lead engineer Peter Rawlinson. Atieva plans on releasing a long-range luxury EV sedan by 2018 and two crossovers by 2020. Sure, Aetiva doesn’t have a factory and is using a Mercedes-Benz Vito van frame to test the drivetrain. A drivetrain that coupled with Aeitva’s “secret sauce” software gives the van 900 horsepower and a 3.1 second zero to 60 time. Aetiva’s goal is to get its sedan to 60 mph in 2.7 seconds because why not? It might be interesting to see these two companies go at it for the loyalty of luxury consumers. I guess. And Washington DC is now the home of the first autonomous bus. http://www.roadandtrack.com/new-cars/car-technology/news/a29573/ibm-watson-bus-driver/ The small bus named Olli was designed by Local Motors, the Phoenix-based company that produced the first 3D-printed car, and uses IBM’s Watson program to learn and communicate with passengers. 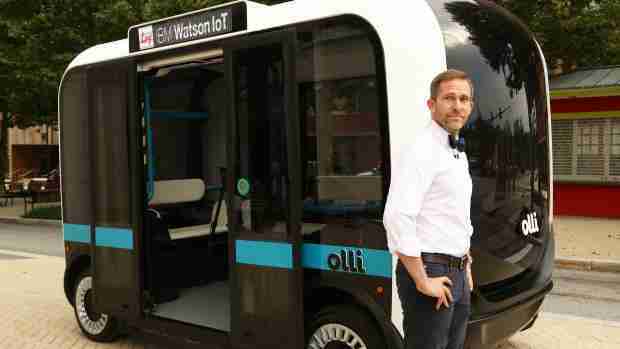 Olli has room for 12 and can be given directions by users and give those users information about the area. The self-driving bus will be available over the next few months as a trial in DC, though Local Motors is aiming to have Olli in Miami and Vegas by year’s end. This is a good tool for people moving within a safe distance, but I don’t see this as an open street type of vehicle. Fetching me and my bags from the airport and delivering me to my rental car? Sure. Taking me across town? Probably not. Dame Helen Mirren is going to be in Fast 8. In Red 2 there is a great scene where she was a passenger in a Lotus and said “show me something,” to co-star Lee Byung-hun and an epic car chase followed. With her signing on to Fast 8, and in the article saying she wanted to drive, I can’t wait to see her behind the wheel.